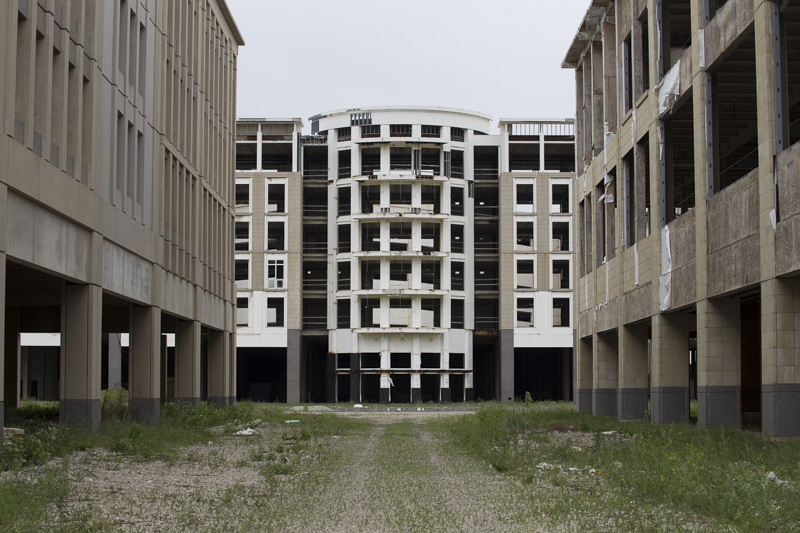 Bloomfield Park, a partially completed town center in the suburbs of Detroit was a stark reminder of the Great Recession. In 1992, developer Craig Schubiner began looking for a place to build a development in metro Detroit. 1992. The site on which Bloomfield Park was a residential neighborhood of about 20 houses, two small lakes, and an empty field where the Miracle Mile Drive-In Theater had operated from 1960 to 1986. Schubiner originally envisioned a health club development located on one of the lakes, but as he began to buy up the land in 1993, the project evolved into a town center. Town Centers were a relatively new urban planning concept at the time. They were part of the New Urbanism design movement which advocates a return to the walkable neighborhoods and main streets, creating a sense of place. One of the first examples of a town center was in Seaside, Florida, a master-planned community built in on the Gulf Coast. Designed by the firm of Duany Plater-Zyberk & Company, Seaside was envisioned as a place where people could live, work, and play, all within walking distance. Since it was built in the 1980’s, the Seaside plan has been duplicated hundreds of times around the country, and New Urbanism has spread from the coasts to inner cities. 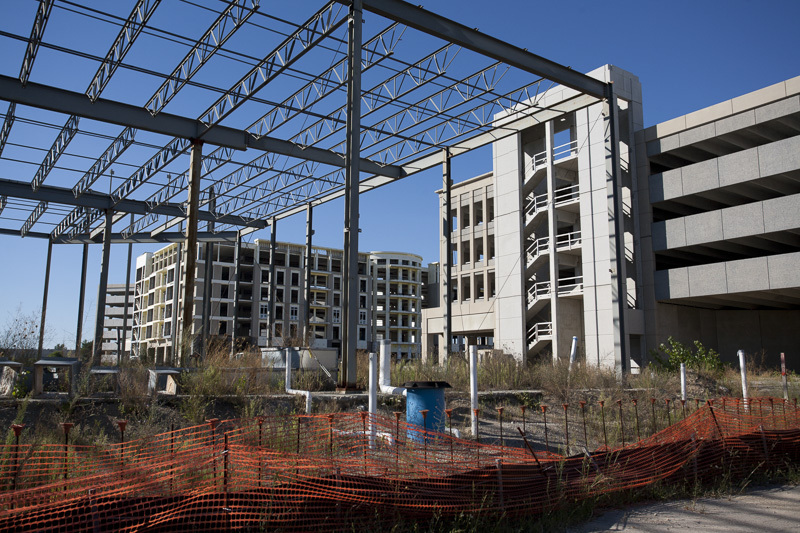 To design Bloomfield Park, Harbor Companies- the company formed by Schubiner to develop the site - sought out one of the founders of New Urbanism: Andres Duany. By 1999, the design was completed. 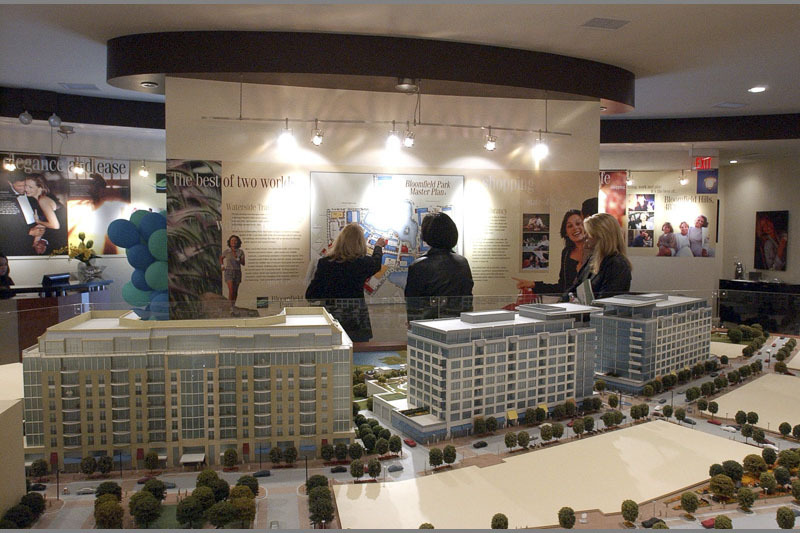 Duany envisioned a planned community that would “…refine the concepts of luxury office, hotel, residential, and recreational life and combine them in the form of a traditional downtown.” Bloomfield Park would have over 1,612 apartments and condos, along with retail shops, offices, a cinema, athletic club, and a 20-story lakefront hotel. 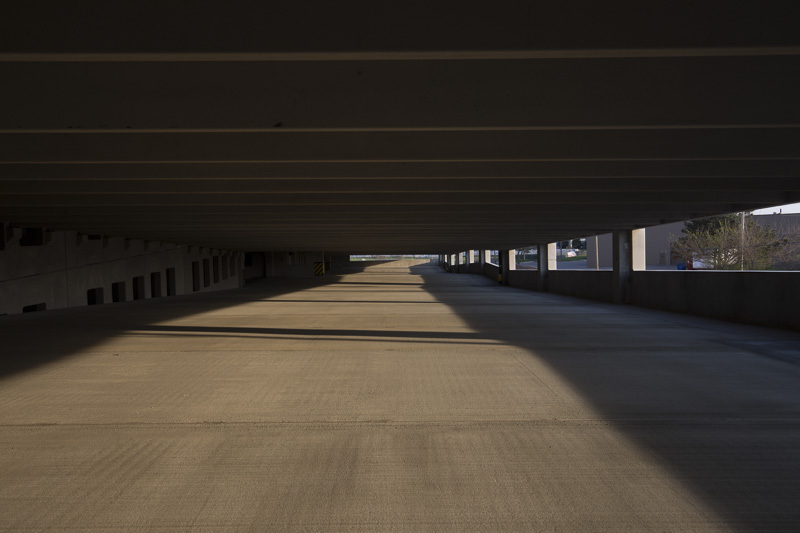 For residents, luxury amenities would include “24-hour doormen, valet parking, high-speed elevators.” The layout emphasized walkability, with the entire property accessible on foot. “Instead of fighting traffic, searching for parking spaces and constantly getting in and out of their cars, visitors will valet or conveniently self-park and then take easy, pleasant walks to their various destinations.” The $2 billion dollar project would start in the spring of 2001, and take seven to 10 years to complete. 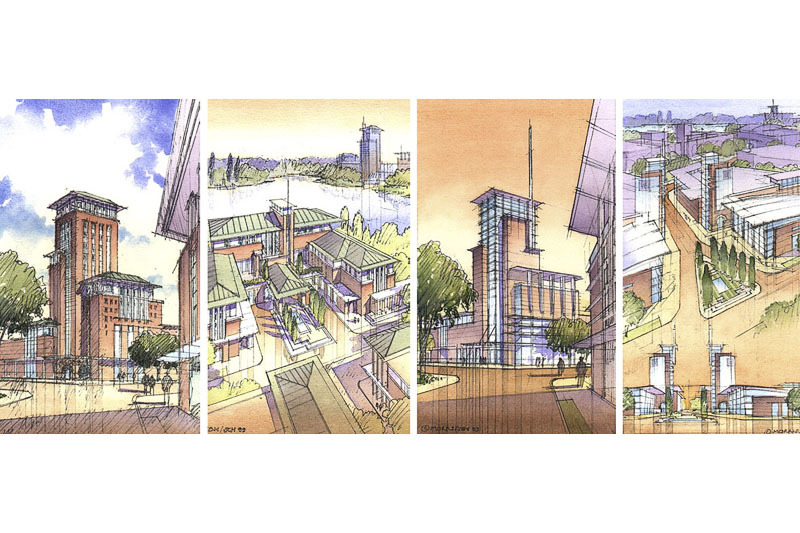 When announced in September of 2000, the proposed development did not go over well with county officials. The first major hurdle was a township ordinance forbidding commercial structures over two stories in height that dated back to the 1970’s. The addition of multiple skyscrapers up 20 stories tall would dramatically alter the character of Bloomfield Township. Local fire departments didn’t have the equipment or training to fight fires in buildings that tall. There were zoning issues. Officials worried that the project would not create enough tax revenue to offset the increased cost of municipal services. And no one was sure how the addition of an estimated 1,800 new residents and 10,000 workers would impact traffic on Telegraph Road. The main issue, though, was that Schubiner had planned the project mostly in secret and with little input from the Township, who were blindsided by the development. 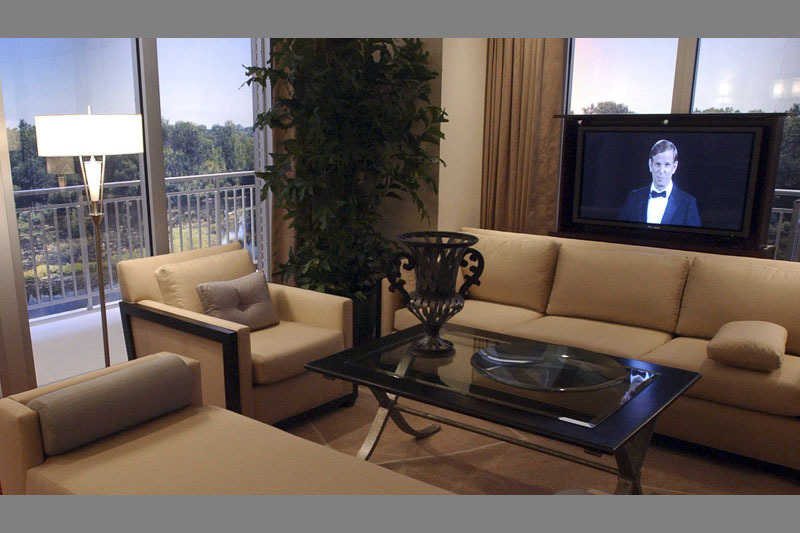 In December of 2000, the Bloomfield Township board voted to reject a change to the zoning laws that would have allowed high-rise buildings. Officials instead wanted to study the project in detail, potentially delaying its start by one to two years. Instead, Harbor Companies found a willing partner in Bloomfield Township’s next door neighbor – the City of Pontiac. 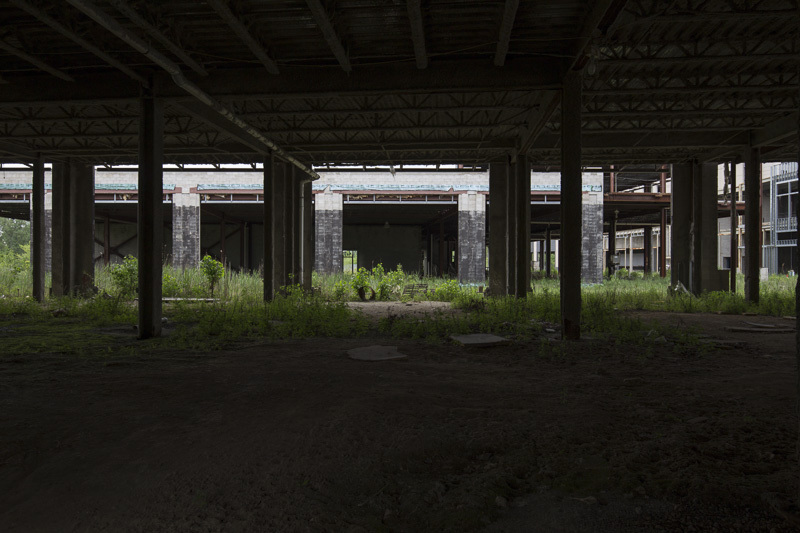 Once a major producer of automobiles, Pontiac had fallen on hard times General Motors closed most of its plants in the city. Now Pontiac saw an opportunity to pick up what the Township was putting down. The site was on the border of Bloomfield Township and Pontiac. 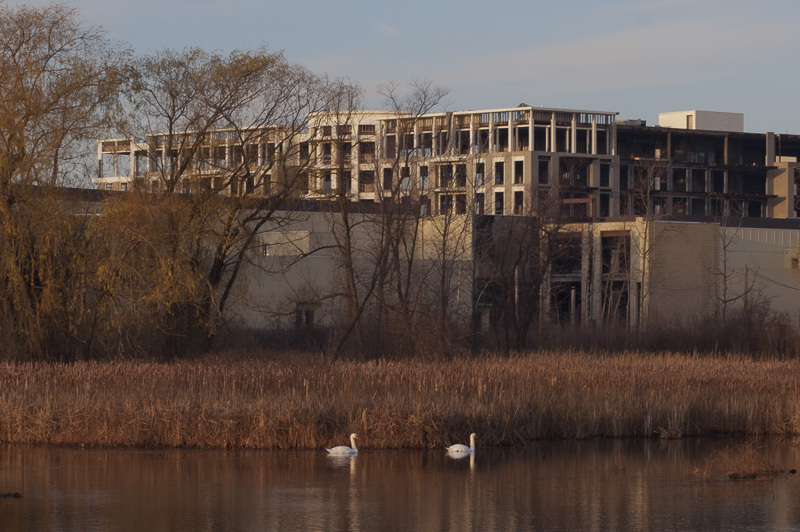 If Pontiac could annex – or absorb – the site, Harbor Companies would no longer be bound by township zoning rules. In exchange for taking over the land, Pontiac would get all of the tax revenue which would provide millions of dollars in funds badly needed by the city and its school system. Bloomfield Township, in the meantime, would get none of the revenue but still have all of the traffic headaches. In July of 2001, the mayor Pontiac announced that the city was moving to annex the land for the Bloomfield Park project. The Township vowed to fight, calling the move “a blatant attempt circumventing established zoning ordinances with the goal of destroying the overall character and integrity of Bloomfield Township.” To annex the property, a majority of all voters in Pontiac and just the Township residents who lived in the impacted area was required. 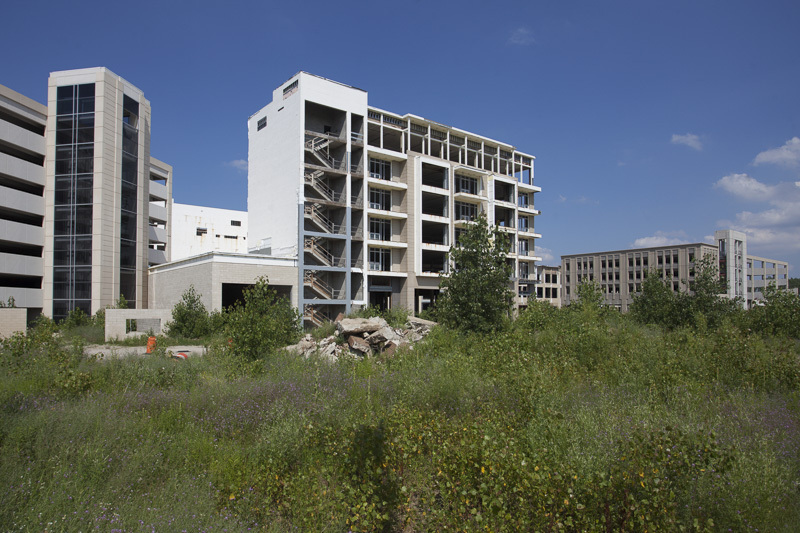 At the time, there were 20 run-down homes on the Bloomfield Park site, all owned by Harbor Companies. 40 people were registered to vote. In September, the annexation passed easily in Pontiac by a five to one margin, but more closely on the site, where just 22 votes were cast. 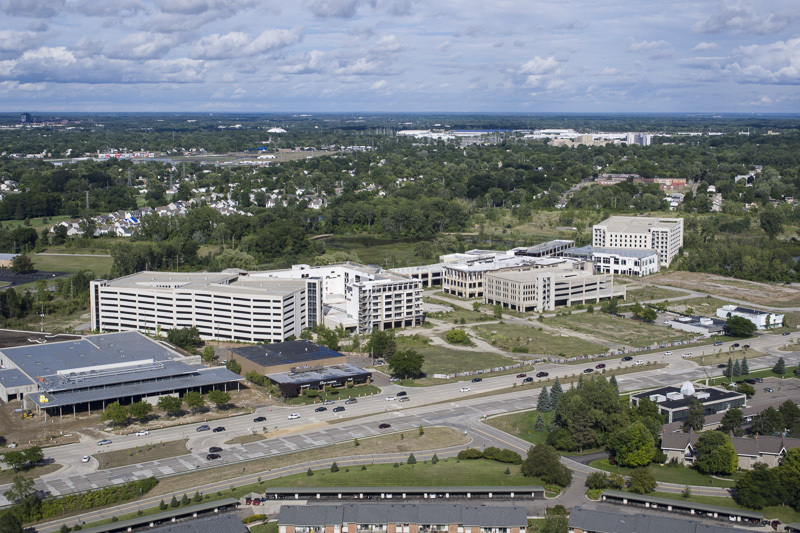 The measure touched off a round of lawsuits between Bloomfield Township, Pontiac, and Harbor Partners that lasted through September of 2002, when a judge found that Pontiac had the legal standing to annex the property. 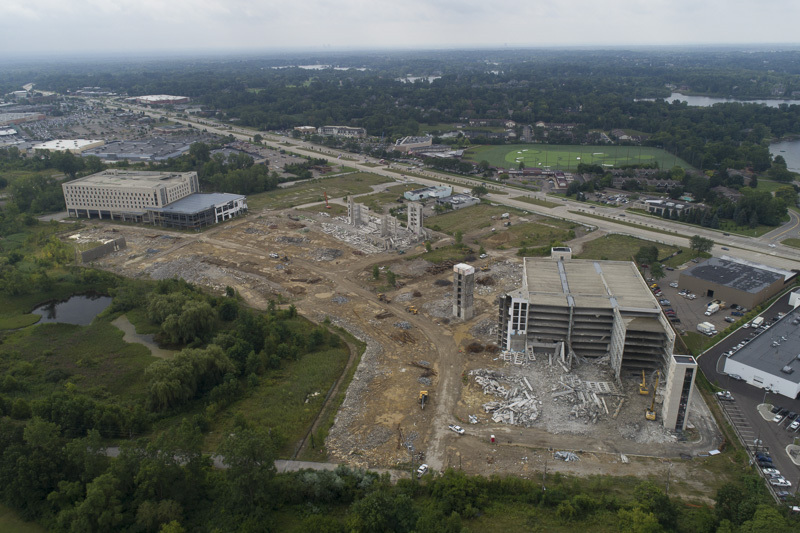 Facing total loss of the project, Bloomfield Township reached a settlement that allowed Pontiac to keep the land, but the Township would get part of the tax revenue. The new agreement would allow construction of eight-story buildings at the back of the property, which would taper down to two stories closer to Telegraph Road. Though the development would technically be in Pontiac, it would use Bloomfield Hills as its mailing address, to keep up appearances. Getting the votes of the Bloomfield Township residents who lived on the project site had been crucial to the annexation. While Harbor Companies denied any effort to sway the vote in their favor, an investigation by the Michigan State Police uncovered by Detroit Free Press two years later revealed that at least six people had been offered free or reduced rent in the houses that Harbor Cos. owned on the property in exchange for their vote on the measure. 14 people people had registered to vote in July and August prior to the election, listing addresses in the area to be annexed. 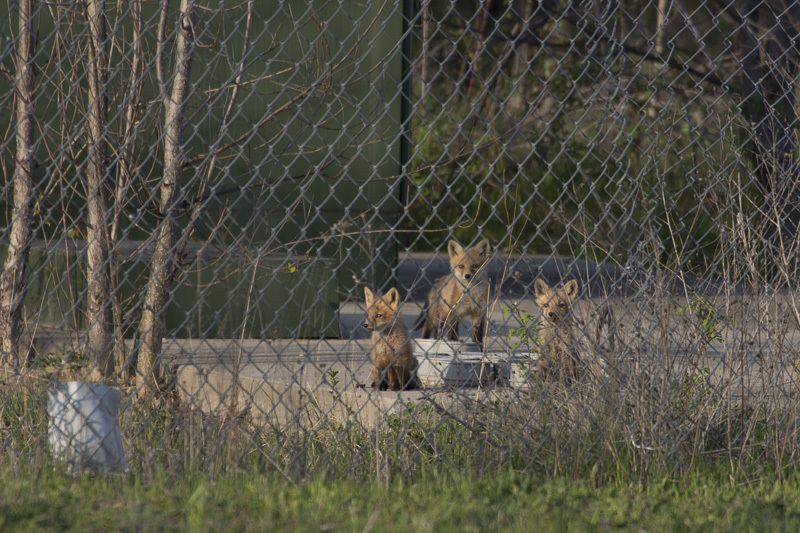 Two of them were employees of the Harbor Companies, and others were offered jobs. It was enough to turn the vote for annexation, which passed 14 to eight. The state attorney general declined to press charges. All of the houses were vacated and demolished when construction started. 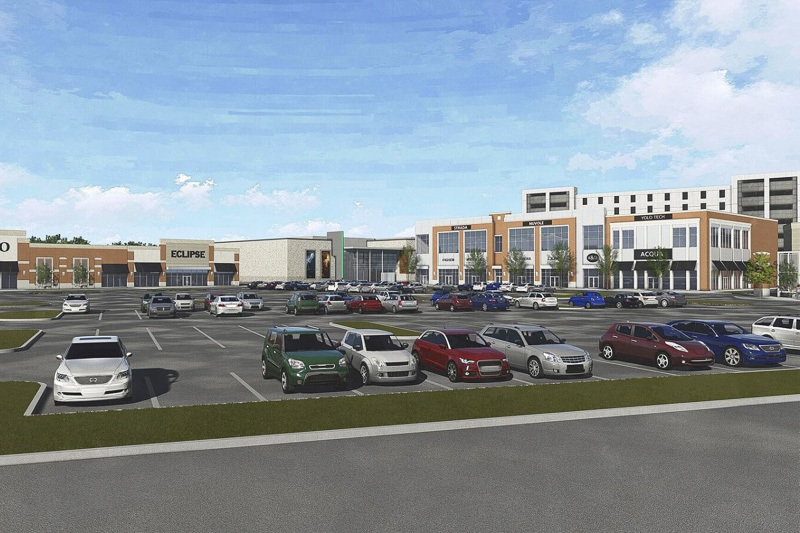 As plans for Bloomfield Park had to be redrawn to fit the new zoning codes, Elkus/Manfredi Architects Ltd were brought on to come up with a scaled-back version of Duany’s design. 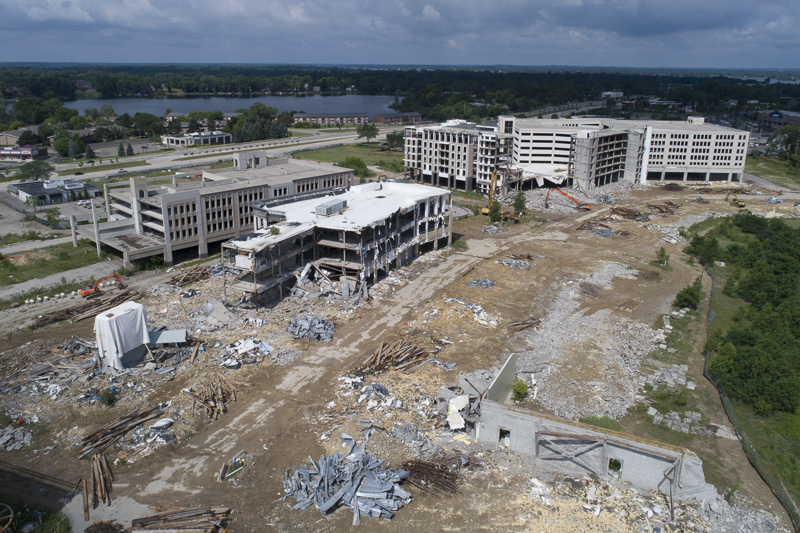 The hotel and most of the office space were moved to later phases of the project, and the number of residential units reduced from 1,600 to 1,200. Though Schubiner and Harbor Companies still planned on breaking ground by the end of 2003, the changes being made required additional time. 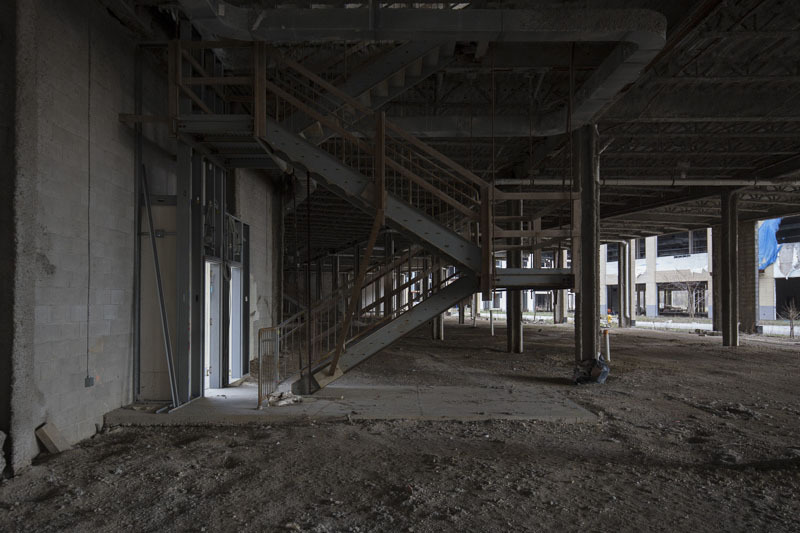 A study by the City of Pontiac in 2004 found that as the project shrank, the cost of providing services to Bloomfield Park outweighed the economic benefits. Within two weeks of the sales office opening, 25% of the condos have been sold for $20 million. But Schubiner and Harbor Companies were having difficulties behind the scenes. 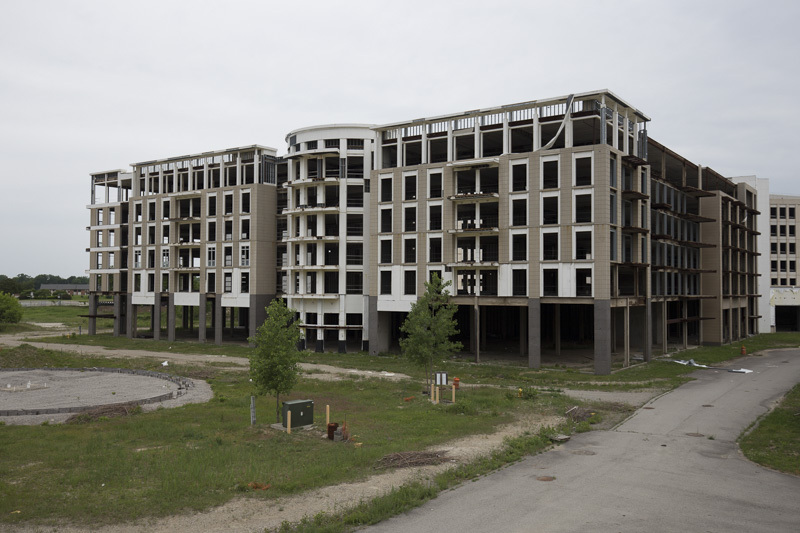 Two dozen requirements set by the Pontiac planning department weren’t met for nearly a year. One of the lenders filed a notice to foreclose on the property in March of 2006, alleging that Schubiner had defaulted on a loan. Though he paid back the mortgage in September, he was forced to return the condo deposits and new partners were brought on the finance the project. 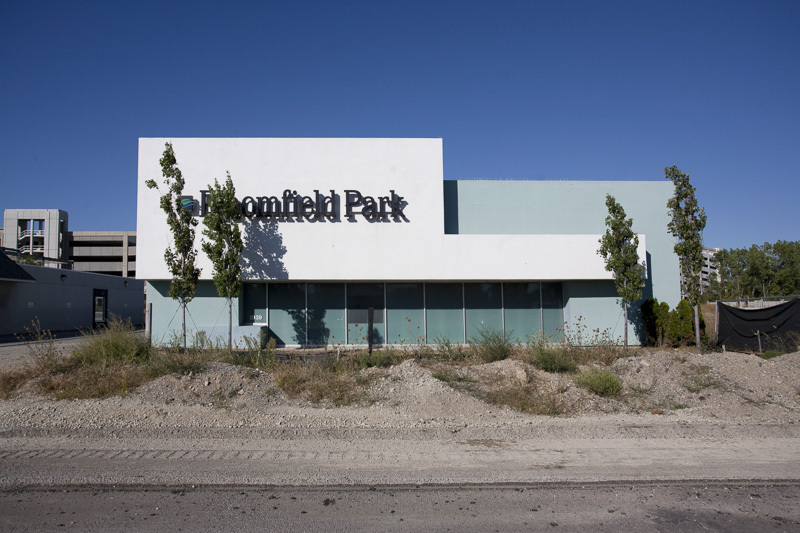 The groundbreaking for Bloomfield Park finally took place in November of 2006, six years later than anticipated. 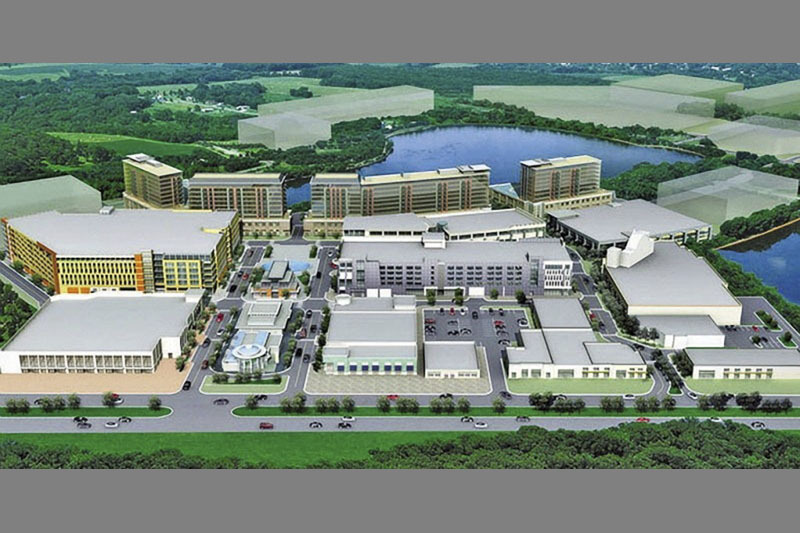 What was originally planned to be a $2-billion-dollar luxury town center had been scaled down to a $250 million dollar “lifestyle center,” with most of the larger parts to be built in later phases depending on the economy. Only seven leases were confirmed – Barnes and Noble Booksellers, Emagine Theater, and five smaller tenants. 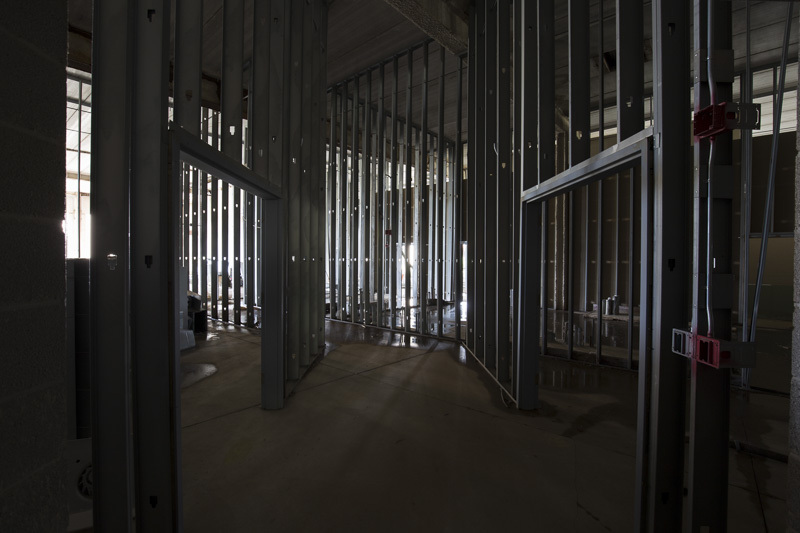 The first phase would include 60 condo units, 127,000 square feet of office space, 533,000 square feet of retail, and three parking structures. Construction, however, was delayed until final site approval in October of 2007. 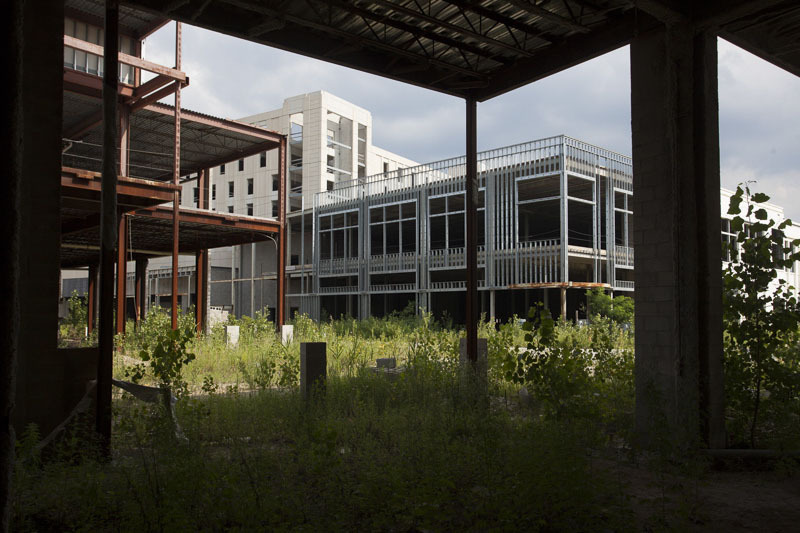 As it began in early 2008, similar retail projects across Metro Detroit were either slowed down or stopped as the Great Recession took hold. 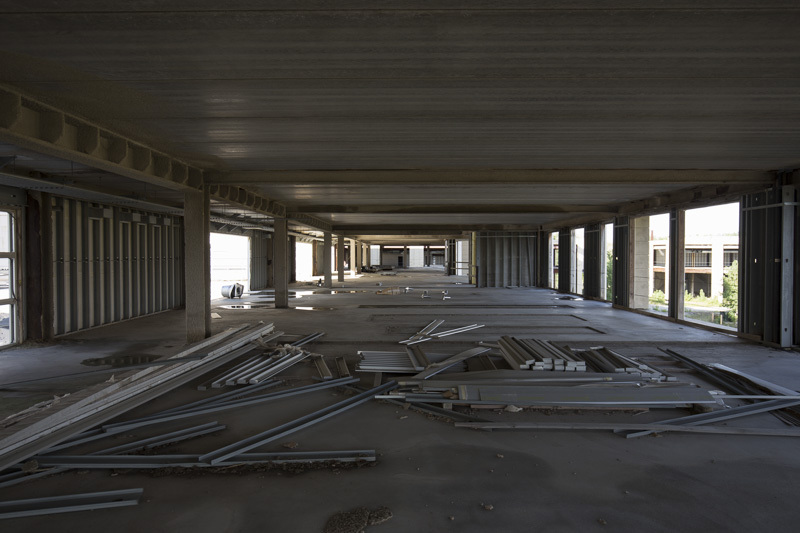 Despite high commercial vacancy rates, Bloomfield Park’s backers believed that the high-end market they were targeting could weather the market downturn. 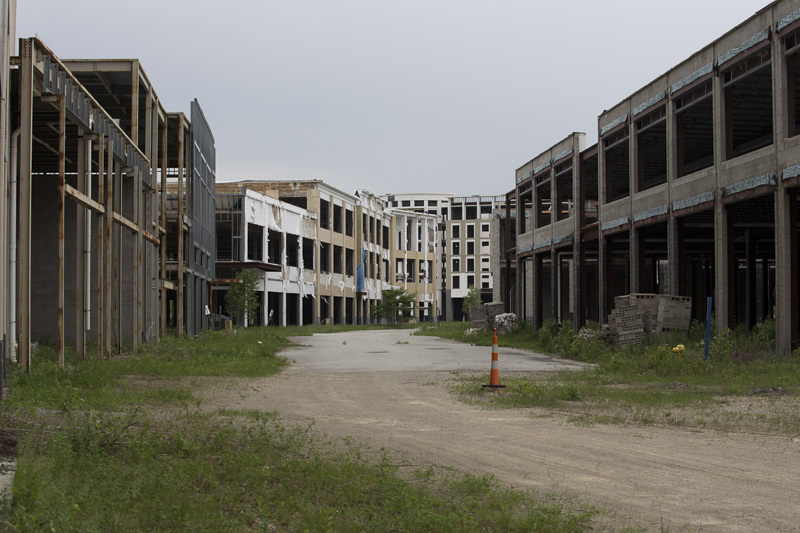 Three large parking structures began to rise above Telegraph Road over the summer, along with a block of condos and a row of retail storefronts. 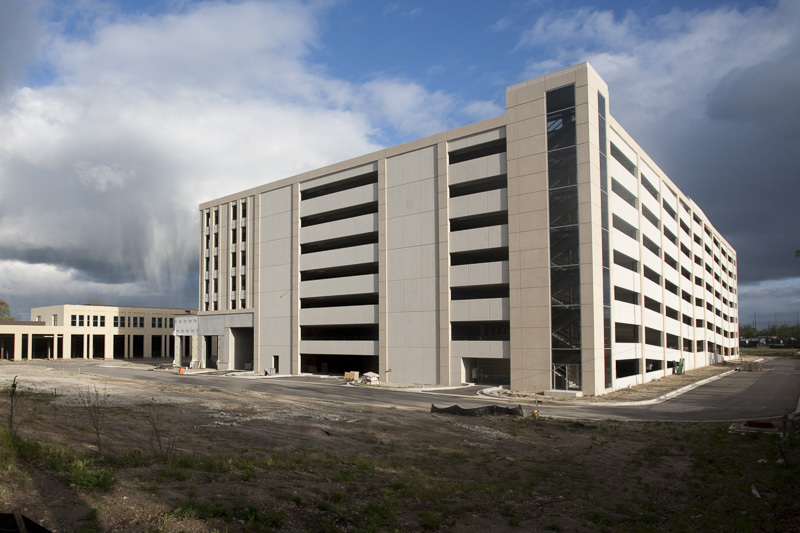 In late August, Schubiner seemed optimistic about the future of the project, telling MLive.com that despite the economic climate, things were going well and leases were being signed. "We had a jump on it before the economic downturn. Leasing activity has been pretty solid." But on November 5th, 2008, construction at the site suddenly halted. One of the primary lenders for the project had run out of money due to the “credit crunch” that was paralyzing the banking sector. Within a few days, workers were told to take their equipment and tools home. Work never restarted at Bloomfield Park. As the developers, banks, and contractors went to court they joined a tidal wave of litigation over similar failed projects. 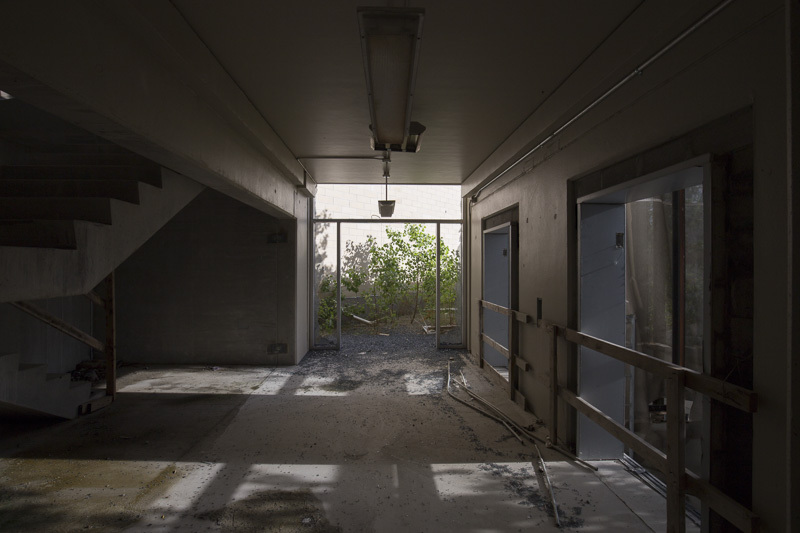 There was money for a security guard to patrol the site, but not enough to mothball the partially-finished buildings. 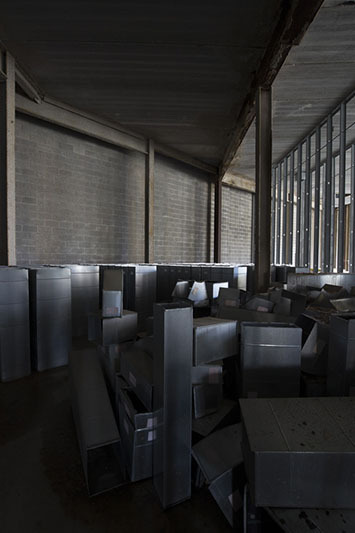 The exposed concrete and steel began to show damage from the weather within months; by May of 2010 there were doubts that it could ever be finished without significant demolition. While a few developers looked into finishing at least part of the complex, most found that it would simply cost less to start from scratch. 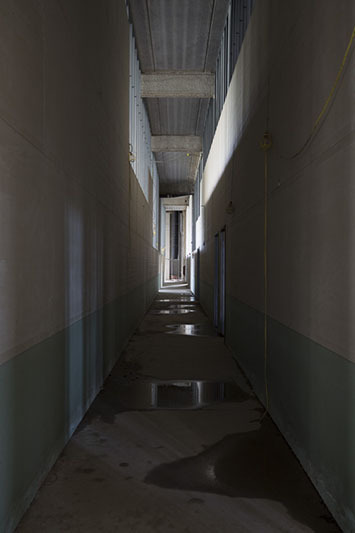 Redeveloping the site fresh would be difficult too – demolition costs would be high because of amount of concrete used. 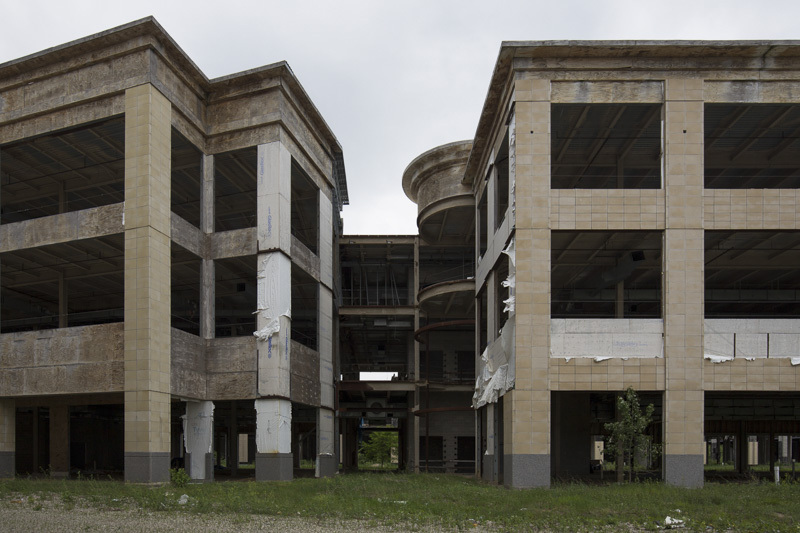 And as time went on, the buildings deteriorated further. 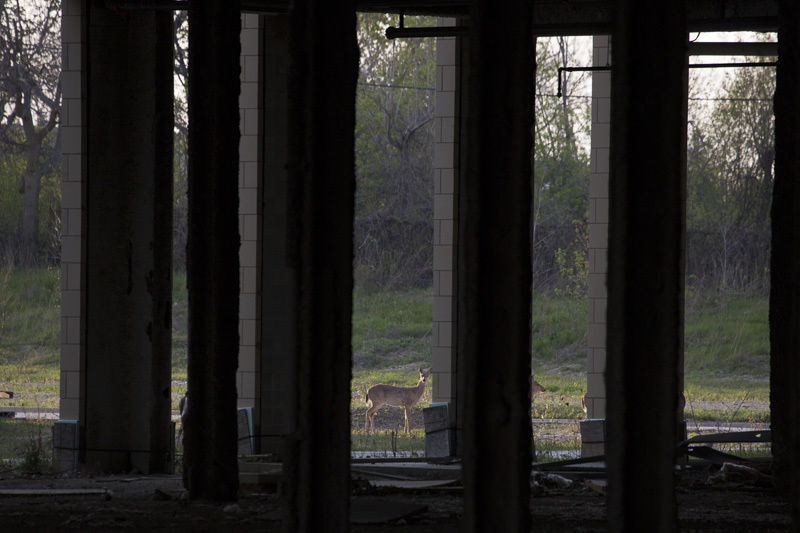 Wildlife took over, as deer, foxes, raccoons, and even a pair of swans made homes in the rusted skeletons. 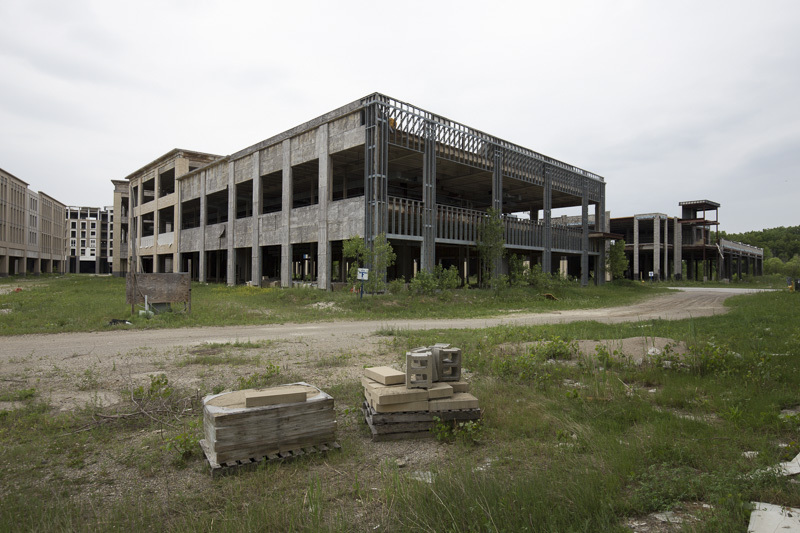 The site finally sold in October of 2014 to Redico, a property development company who began assessing the buildings to see what could be salvaged and what had to be torn down. 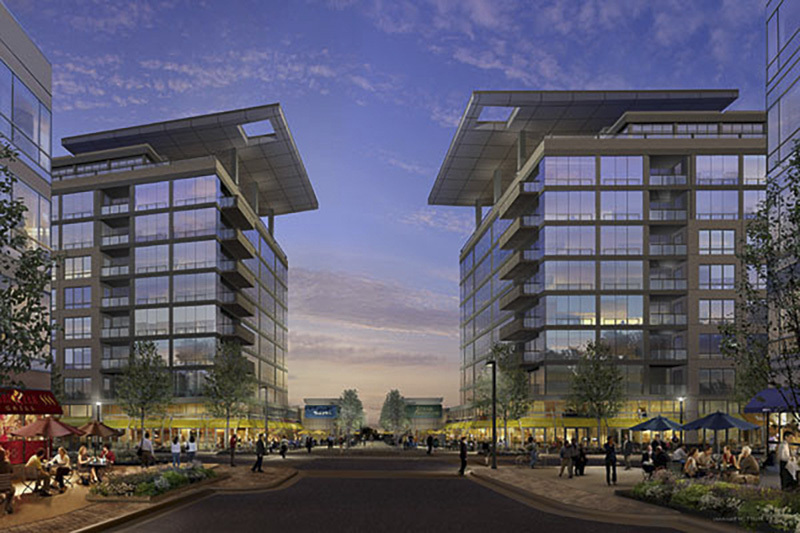 Since then Redico has proposed several different mixed-use plans, including specialty retail, an upscale grocery store, and the potential for housing. 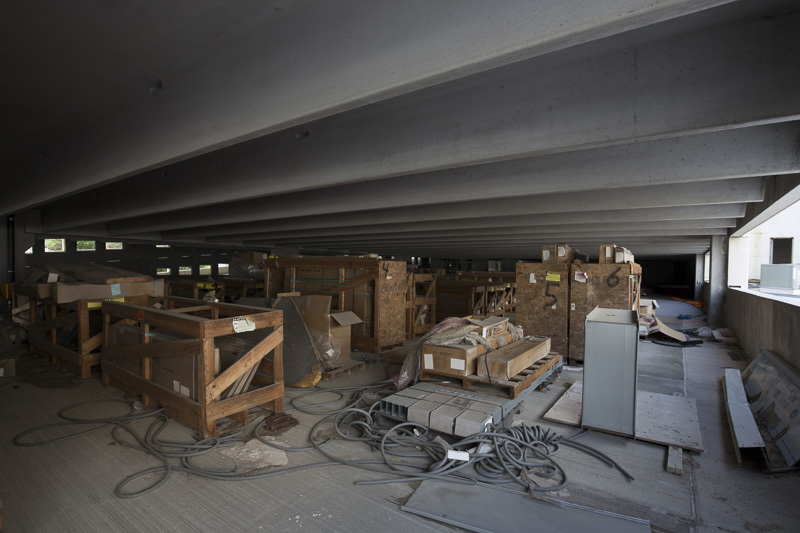 Only two of the buildings proved to be salvageable – one of the parking structures, and the retail building attached to it. 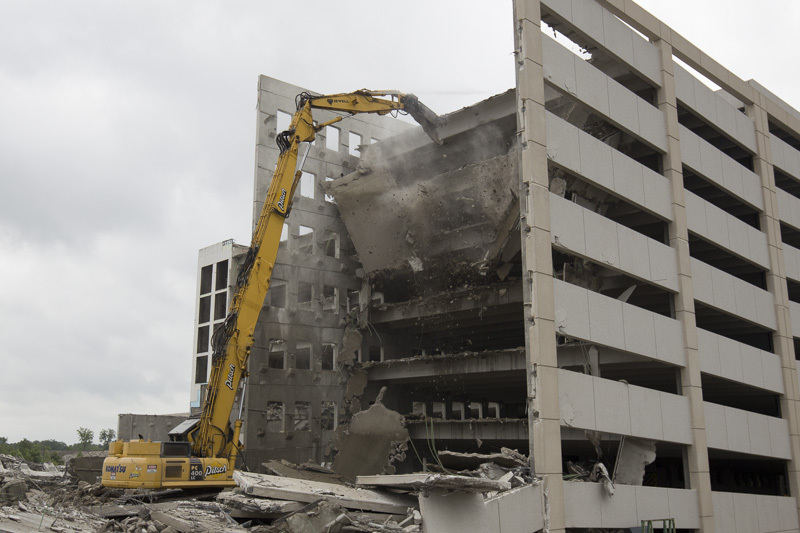 The remaining buildings were demolished over the summer of 2017. Construction on the “Village at Bloomfield” is expected to start in the fall of 2017.